A smile is a universal language that connects people from all-around the world. When you greet someone, you smile. When something or someone brings you happiness, you smile. In fact, people living in the United States smile the most. Could you imagine making it through a day without smiling? Unfortunately, for some people, their smile is hardly ever shown. But, with our handcrafted dentures, that can all change, especially since they can give people the confidence to smile again! Back around 700 BC, Etruscans made dentures out of animal or human teeth in northern Italy. As the centuries have passed, new technology has been developed to make dentures look even more natural and lifelike. More than 75-percent of Americans have some form of anxiety when it comes to visiting a dentist. Especially if the dental visit is in regards to an oral health-care issue like getting dentures, the fear is even higher. The cool technology available at Shelby Dental Center grants dental laboratory technicians like Ford to create handcrafted dentures in the same-day as the patient’s visit. Therefore, he or she doesn’t have to make separate appointments when getting dentures, and the patient can leave our office that same day with a smile! For the most part, dental facilities have to send an order to a third-party for dentures to be made, which can take up to two to three days. However, at Shelby Dental Center, our in-house laboratory allows our team to create natural-looking dentures in two to three hours! This can save patients the time and convenience of not having to wait another few days to finally get their dentures. 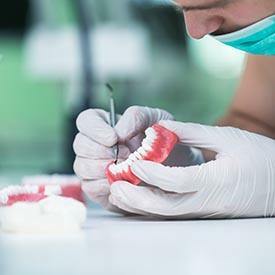 Plus, with an in-house lab, Ford can meet with the patient, listen to what he or she likes about the dentures, and can, then, go back and change anything about the denture until the patient feels comfortable and confident leaving the chair. Do you feel your confidence could be improved with the help of dentures? Schedule an appointment with our knowledgeable and experienced dental team today by contacting Shelby Dental Center at (205) 664-1190. For more information about Shelby Dental Center and the services offered, visit www.shelbydentalcenter.com.